They will also, I hope, get an insight in to the differences and similarities between 1960/70s football and the modern era as well as learning about “the Arsenal Way and the Arsenal Education.” This is a special club with a unique elegance and class in how it does things – Geordie Armstrong helped create that heritage and epitomised and embodied it for nearly 40 years. This is what Dave Seager said in this interview with me a few months ago when asked what he would like to say to younger fans for whom George “Geordie” Armstrong is only a name, maybe not even that. Born in 1989, I only started watching football (and consequently supporting Arsenal) from 2002-03 and the only football world that I know is the one of the Premier League, vastly different from what came before. Morever being born and brought up in Mumbai, I was also far-removed from the culture where this knowledge and history is passed down through family, through the generations. Which is why I remain eternally grateful to all the books I have been able to read and some of the lovely people I have met on Twitter who have first-hand experiences about a time completely unknown to me. Another different approach is that it starts at the very end. The first proper chapter after Dave’s preface, the foreword by Jill and the introduction by Bob Wilson is of the tragic, untimely death and funeral of the then 56 year old Armstrong. Despite only knowing what we do from the introduction, I will dare you not to be moved (I had a lump in my throat throughout) by the poignant and touching description of how Geordie was laid to rest in the presence of his family, most of his former teammates from that 1970-71 team, Arsene Wenger, the current Arsenal players and the entire coaching and working staff at the club. There is an emotional togetherness that is immediately evident and one that will form one of the common threads throughout this book. It is part of what forms the foundation of Arsenal Football Club and Seager has done a great job harnessing this as the core of his narrative. George Armstrong, born on August 9, 1944, was a diminutive kid throughout his childhood and even later a small adult. But everyone he has ever played against was clear that it was he who intimidated the opposition, he who had phenomenal fitness levels and an unending reserve of determination and energy. 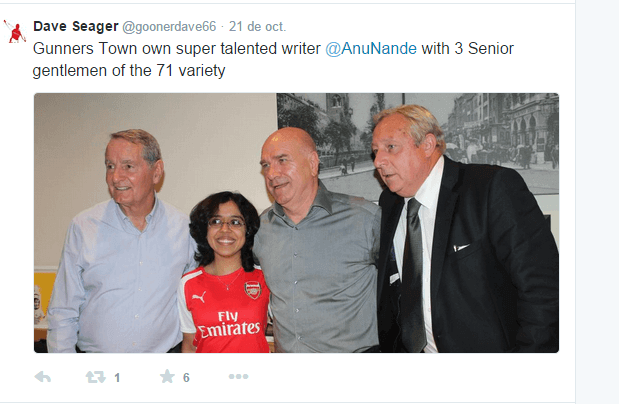 Considering the dreadful conditions of the surfaces he had to play on for the first decade or more of his career, it is a wonder how he played 621 games for the Arsenal between 1961-1977, rarely getting injured. In those early days, only one substitute was allowed and Geordie started 607 of the 621 games in which he featured. It is rare to come across an individual so universally loved, praised and missed but Geordie seems to be one such example. If you are skeptical about biases held by his own teammates, the similar opinions of opposition players and journalists should convince you that he really was a genuinely good person apart from being a great footballer. None of their heartfelt words ever seem hollow – a very unusual occurrence – and throughout the book there are some fascinating, funny and touching anecdotes involving Geordie that I will not spoil. But that is not all. Throughout the book, there are linking themes that emerge – Geordie’s precision crosses (his ability to land a cross on a sixpence or a matchstick), his unending stamina running up and down that left wing, the certainty that he could seamlessly fit into the current Arsenal team, the confusion at why he never got a chance to showcase his talents for England – “the best player to never play for England” – (Sir Alf Ramsey’s Wingless Wonders strategy is the most common reason offered but many dismiss that by explaining how he still could have fit in and succeeded), how he would always insist on buying the first round at the bar even though he wasn’t a big drinker and how he always had time and a kind, supporting word for the younger players. As many of that legendary 1971 team rightly point out, Geordie was a box to box winger at a time none existed! His inclusion and debut because of an injury to then winger, Johnny MacLeod led to the change in tactics and formation that was to prove the most successful for Arsenal throughout his time at the club. He was not a traditional winger instinctively bombing forward to attack. Geordie was a facilitator, getting past the defender onto the byline and whipping in a perfect cross at the first chance, but he would also be equally involved at tracking back and defending if the team lost the ball, always on the lookout to convert defence into attack. This provided a much needed balance to the freely scoring but also freely conceding Arsenal side at the time. It also allowed the right winger far more attacking freedom but not at the expense of the defence. Also heavily featured are his famous moments in the red and white – the Fairs Cup final 2nd leg versus Anderlecht (argued to be his best game ever), the pin-point cross to Ray Kennedy that allowed us to win the league at White Hart Lane in 1970, the FA Cup final that completed a historic double. In keeping the words of the contributors largely intact, there is a vivid sense of the reader having been present during those events even if in reality they weren’t even born! This adds to the personal feel of the book and allows us young readers a glimpse into a world we will never know with people we will never meet, a world that has shaped the one we so delight in today. Work rate and effort are words usually designated to players who are solid, dependable but not necessarily very skilled. There is no doubt that George Armstrong was a player that lacked flair. (As Alex Forsythe commented, Geordie never saw the point of beating a man more than once to get a cross in) But that shouldn’t discount his talents, his importance to one of the greatest teams in Arsenal’s history. He seemed to have played for the love of the game and his team without caring about the spotlight or the flash of a football celebrity’s lifestyle – even faintly embarrassed about his love for expensive cars. This moral code never left him and all the youngsters who later trained under him, in the Arsenal reserves and before, still feel its benefits as is clear from their emotional testimonies in the book. All of them are in agreement when they say that Geordie was responsible for showing them by example that it was possible to be a no-nonsense footballer as well as a thorough gentleman. He was the perfect mentor with his genuine nature, extensive knowledge and a deep love for the game and of course the club, even when he was in places as far away as Norway and Kuwait. George’s son, Tom’s fiancée was expecting their first child around the time Geordie passed away. The motivation for this book sprang from wanting the future grandchildren to know a grandfather they would unfortunately never meet. But it is not just them who need to appreciate and cherish someone who literally gave his life for our beloved club, someone whose contributions are still relevant and significant for their continued resonance at Arsenal – it is all the young Gooners and fans in generations to come. This Arsenal Way is part of the very fabric of the club we are today very proud to call our own and it is imperative for us to be aware of the people and events responsible for shaping its heritage. 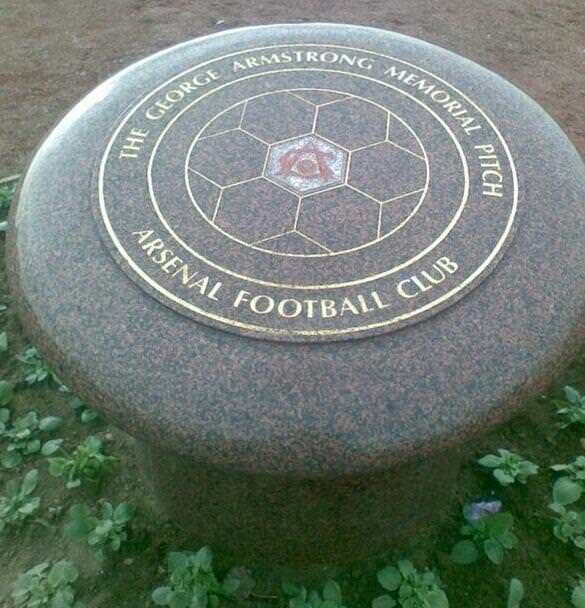 Fittingly one of the last chapters deals with the inauguration of the memorial stone at the side of the main pitch at London Colney (renamed “George Armstrong Memorial Pitch”) where on October 31, 2000 the tragic events transpired. This book is clearly a labour of love. A love that started with Geordie’s for the beautiful game, Arsenal Football Club and his family and runs through each and every one of his former teammates. It is the very love that made Jill (a wonderful, friendly person) want this tribute written and the same that prompted Dave to put so much of his time and effort into making that happen. 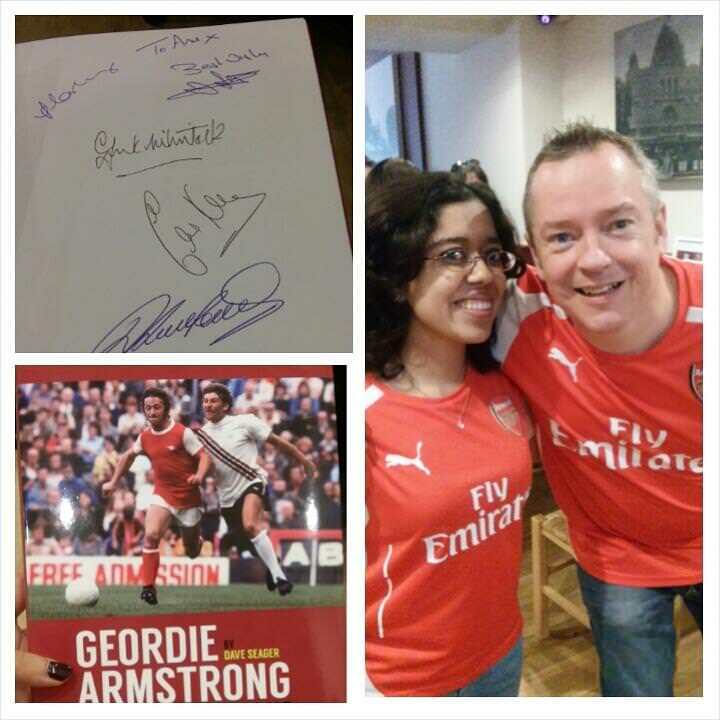 It ends with the instant love and respect we feel for Geordie Armstrong on reading the book, whatever our age or fan story. Geordie Armstrong On The Wing made me feel the loss of someone I wish I knew and that is the highest praise I can give it as well as everyone involved with it.